Executive presence has long been acknowledged as an important, yet mysterious “X-Factor” in leadership. Why do so many people talk about presence, and, how do you define it? If you have received feedback on your presence, how can you develop it? This course will answer those questions. For every leader who wants to be ready for the top job, or has moved into a senior role and wants to make a bigger impact, we address the fuzzy definitions and diverse perspectives by introducing a science-based model of presence, which is now used in top companies and in more than 40 countries. This highly practical course will open your eyes, and encourage you to see how easy it is to develop your own authentic and powerful brand of presence. You’ll discover how others view your presence and what that means to your ability to influence and make an impact. The course is built around a science-based assessment based on empirical studies in leadership, communication, psychology, and social action, philosophy and ethics. Highly practical, informative and business-friendly, the course opens the aperture on your own strengths and gaps, and gives you tools to develop the kind of presence that opens the doors to the C-Suite. Group rates are available for 3+ people. Call 800-908-8239 for details. What Will You Learn in Executive Presence Mastery? 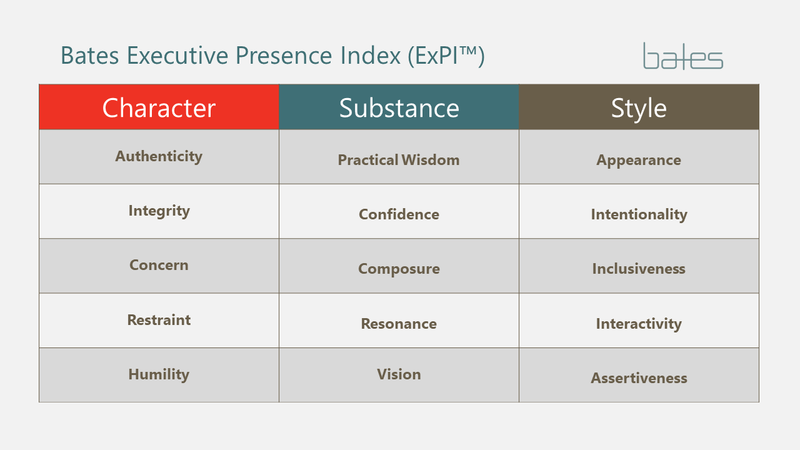 The Executive Presence Mastery program provides you with a clear path to understanding your executive presence and how it is felt by others. It is a holistic approach to leadership that looks at your brand of presence in three dimensions – Character, Substance and Style. The Bates ExPI™ Assessment, and pre-conference insights delivered by a Bates coach, will enable you to discover your strengths and gaps within 15 areas of leadership. 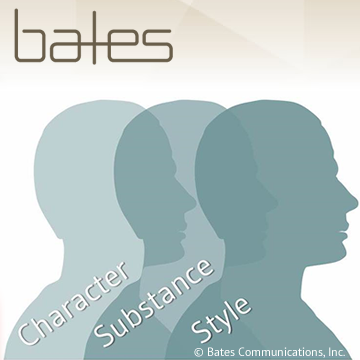 Prior to the program, you’ll have the opportunity to complete the Bates ExPI™, a multi-rater 360 assessment that gives you valuable feedback on 15 facets of your presence and influence. You’ll have a confidential feedback and interpretation session with a Bates coach, who provides guidance in interpreting your Bates ExPI Leader Report. Along with the coach, you’ll identify concrete steps to apply what you’ve learned to two important, business relevant themes that are drivers in your current role. To register, complete the form above. You’ll then be prompted to complete payment to secure your registration.